Remember Eileen? 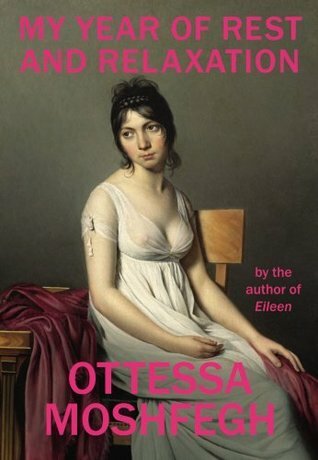 I’m a fan of that book, despite its depressing heroine and its disturbing weirdness (or probably because of it). Sure enough, Moshfegh has delivered another weird story with an unlikable character. And, once again, it was hard to put down. I had started “hibernating” as best I could in mid-June of 2000. I was twenty-four years old. I watched summer die and autumn turn cold and gray through a broken slat in the blinds. My muscles withered. The sheets on my bed yellowed, although I usually fell asleep in front of the television on the sofa, which was from Pottery Barn and striped blue and white and sagging and covered in coffee and sweat stains. I don’t think the narrator of My Year of Rest and Relaxation even has a name. Not like her poor friend, Reva. But maybe that’s the way she would have wanted it. She is, after all, attempting to wipe out her life up to this point, so she can start over with a clean slate. Maybe she will also give herself a new name? That is, if she makes it through the year. All she wants to do is sleep. She is lucky enough to have some money from her parents, as well as the rent money from their house, so she decides to take a year off to rest. And by rest, she means sleep. And by sleep, she means chemically-induced unconsciousness. My hibernation was self-preservational. I thought that it was going to save my life. Sleep felt productive. Something was getting sorted out. I knew in my heart – this was, perhaps, the only thing my heart knew back then – that when I’d slept enough, I’d be okay. I’d be renewed, reborn. I would be a whole new person, every one of my cells regenerated enough times that the old cells were just distant, foggy memories. My past life would be but a dream, and I could start over without regrets, bolstered by the bliss and serenity that I would have accumulated in my year of rest and relaxation. Our narrator (conveniently) finds a doctor nutty enough to prescribe to her all the pills she wants. All she has to do is show up at her appointments and tell her doctor she still can’t sleep. Ambien, Valium, Ativan, Xanax… You name it, she’s got it. She proceeds to ingest unbelievable amounts of pills. Most of the book is made up of her taking pills, watching DVDs (Whoopi Goldberg is her hero, so she can’t be all bad. ), fading in and out of life, thinking about trying to think about life as little as possible (the more she tries not to think about things, the more she thinks about them), trying to piece together what she did while in black-outs (shopping, clubbing, waxing, manicures, boarding trains) and realizing that black-outs are counter-productive to “rest and relaxation”. And, periodically, her friend Reva comes over to visit. Mostly, Reva seems to come over to drink and complain about herself and her life. Reva has her own problems and she can’t have many friends, because she continues to come over to see our narrator even though she gets little response, and when she does get a response it’s not usually very kind or sympathetic. In short, our narrator is not very likable. But somehow she had me rooting for her. For her own sake as well as everyone else’s, I wanted to see her experiment work. I wanted to see her come out the other side a better, happier (kinder?) person. On the other hand I felt I might be disappointed if the story ended too unrealistically. I mean, after taking all those drugs every day for an entire year, it surely wouldn’t be a piece of cake to come off them. I still feel a little conflicted about the ending, but I’m not going to tell you why. I’m happy with unlikeable characters who are often much more interesting than the likable variety but I didn’t click with Eileen in quite the way I’d hoped after reading lots of positive reviews. I suspect it might be the same with this one. I’ve never heard of either the book or the author and, given what I just read of your review, am not likely to ever read this one. Disturbing book, disturbing behaviour. I heard an interview with the author about this book (on TNYT Book Review podcast) and it was pretty interesting. IIRC, she says pretty much what you said, that the amount of pills ingested was over-the-top, but the whole thing seems a little that way – like how much privilege and entitlement she has/feels to excuse herself from the world around her, when her complaints do not seem to merit this response. She’s an author who really interests/intrigues me, but I haven’t gotten around to reading anything yet. I’m so glad you told me that – I should listen to the interview! For some reason I feel better knowing that the author knew that what she was writing was over-the-top. And I wanted to point out that it was over-the-top, but at the same time it didn’t really bother me (except that it made me want to google what would actually happen if someone tried this experiment). I like the way she writes, but I also find her subject matter intriguing. I will definitely keep reading her books. Now I’m anxious for you to pick one up! It sounds a little like the classic Russian novel Oblomov. I haven’t read Oblomov, so I couldn’t say. But that makes me wonder what inspired the author’s idea for the book! I agree – I don’t think this getting up and going to school/work through the winter is entirely natural. Most people I know would rather “hibernate”. No, it didn’t depress me. I could just be weird, but I didn’t find it depressing at all. I found the whole idea of it intriguing. Not that I would try it! Ha! I found Eileen compelling but didn’t enjoy it, if that makes sense. So I had no interest in reading this one but you so make it sound fascinating. That absolutely makes sense! I think this one is less off-putting than Eileen, so you might like it more. The narrator doesn’t disgust herself – she just wants to sleep. I’m worried that this book fits into that trend of 20-somethings who don’t know what to do with their lives, so they don’t do anything. It’s really popular in the small press world, and it’s typically written by men. On the other hand, I never read Eileen, so I don’t know what this author’s writing style is like. A similar-ish recent read by a female author would be The Idiot by Elif Batuman, on last year’s Women’s Prize for Fiction shortlist. You’re right, I did hear about that one. This book definitely falls under “stories of privilege” (if there even is such a category). Not many people can afford to take a year off. But the narrator in this book did think she knew what she wanted to do, only to be disappointed by life. I’m guessing her most pressing concern, though, was depression. I’m still trying to get a handle on this author, but so far it’s been interesting! I was wondering if you were going to read it! Does your library have it? That’s where I got my copy. I’m not sure about Moshfegh’s writing, I didn’t really get on with Eileen. I do admire her willingness to create unlikable female characters though! I have been on the fence about whether to read this one or not. On the one hand it sounds like a bunch of nothing — or a person who wants to do nothing, but on the other hand people seem to like it. Is she really a genius of an author? Would you say you were disappointed with the ending — does just end abruptly or is it more than that? still trying to gauge whether to read it. Not disappointed with the ending… just wondering about it and wishing to discuss. I wouldn’t say that it ends abruptly. I don’t know if she’s a genius, but I definitely find her writing intriguing. If you’re on the fence, I think this is the kind of book that you could read the first chapter or two and know whether or not you’d want to keep going. I’ve been intrigued by the cover of this book and I feel like I’d read one positive review, but I hadn’t realized what it was about. Having read your description, it sounds a bit too strange to me! But, I get that not everyone likes that! I just read and reviewed “My Year of Rest and Relaxation”. I enjoyed it so much, but have heard polarising views about Moshfegh’s other books. I don’t know if I should also give them a try or not?! If you loved My Year of Rest and Relaxation, I think you’d also like Eileen. Maybe even more! Definitely worth a try! Great! I think I will give Eileen a try.